Richmond, BC, Feb. 12, 2019 – FPS Food Process Solutions (FPS) has acquired majority control of Charlottetown Metal Products (CMP). FPS is a global leader in turnkey food freezing and cooling equipment and has been growing at a compounded rate for the past 8 years since their inception in 2010. Led by President, Jeffrey Chang, FPS has offices in Vancouver, BC (head office), southeastern United States, Brazil, China, the Netherlands and now adds a significant east coast Canadian operation to their portfolio. CMP has been designing and building custom food processing equipment for over 60 years and serves renowned global multinational companies. CMP is also one of PEI’s top employers, with a staff of 80. FPS is pursuing a major expansion to the existing 43,000 sq foot premises in Milton, PEI and has plans to double CMP’s facility, staff and revenues in the next 3 years. FPS Food Process Solutions is a global leader in turn-key food freezing and cooling equipment. We provide innovative systems to ensure the highest efficiencies and to meet the most stringent sanitary demands. These factors transform into superior food quality, lowered cost of ownership and maximized profits. Our goal at FPS is simple. We strive to create a singular standard in our industry - the highest standard. Alongside our clients, we call this the FPS Standard. Founded in 1957, CMP is a high-quality, custom stainless-steel equipment manufacturer singularly focused on the hygienic design of food processing equipment. CMP offers layout and design, custom fabrication, and on-site installation and commissioning services. 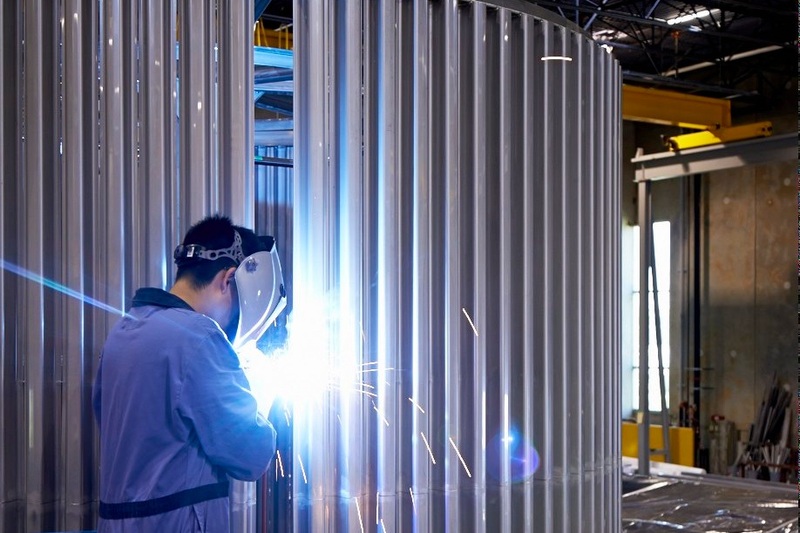 CMP has a best in class engineering team, and a dedicated crew of ASME, CSA, and CWB certified technicians and fabricators and is located in Prince Edward Island, Canada. FPS Food Process Solutions Corp.
Vancouver, BC – FPS Food Process Solutions has opened a new Parts & Service Center in Cartersville, GA. FPS currently provides retrofits and services to clients anywhere in the world, and this new center will allow FPS to urgently ship parts and greatly increase the level of service available. FPS retrofit specialists are not only experts with our equipment, but also equipment from other suppliers. The retrofit services largely help clients increase capacity and prolong freezer life while our service can help clients’ equipment run optimally and minimize any downtime. FPS offers comprehensive retrofit packages from system evaluations to complete structural and enclosure rebuilds. With recent global attention on environmentally friendly practices and food safety concerns, existing equipment can be evaluated and upgraded to energy efficient operation and meet current hygienic demands. 24-Hour Service and a Support Hotline is also available to clients who need urgent help. FPS provides immediate support with emergency service, product inquiry, spare parts support, and more. Our technical support specialists provide immediate responses to questions. Vancouver, BC – In late 2018, FPS Food Process Solutions launched its newest product, the Spiral Immersion System (SIS). The Spiral Immersion System (SIS) is a revolutionary new patented food processing platform for chilling, freezing, pasteurizing, cooking and chemically treating food products. The SIS is a spiral conveyor in a tank of liquid, usually water or brine, that is faster, cheaper, produces a better-quality food product, produces a safer food product and takes up less space than air chilling. The science behind the SIS is that heat is transferred 25 times faster in water than in air and water is easier to move around than air. A 2 or 3 hp water pump can move the same amount of heat as over 100 hp of fans moving air. The result is that in the SIS the surface of food freezes 25 times faster and the core freezes 20-70% faster, the footprint is 50% smaller, it uses 80% less energy for the same throughput and the SIS requires 30% less refrigeration tonnage. FPS will be showcasing an SIS prototype at its Booth#7143 in Hall B. As a leader in hygienic design, FPS will also be presenting a TechTalk at IPPE. This is an opportunity to learn about how to make food production faster and safer. FPS Food Process Solutions Opens First US Office In Cartersville, Georgia. Vancouver, BC – FPS has set up a new Parts & Service Center in Cartersville, Georgia — just one hour away from Atlanta. The new location will be our first office in the United States and is led by our Technical Services Manager Mark Bellow and our Business Development Manager Jay Loy. The new office houses a technical service support team and provides quick access to spare parts for customers. FPS will have a dedicated team to service and retrofit self-stacking spiral freezers to ensure customers can have single point service for all their freezer needs. The new facility, which contains an administration office and warehouse, adds another 15,000 sq. ft. to FPS. With the expansion, FPS can provide a full range of installation and modification services across the United States. “I’m excited to see the Cartersville Office open. It demonstrates FPS’ commitment to ensuring our customers receive the best service for all their freezing and cooling equipment,” stated Justin Lai, VP Sales & Marketing. Vancouver, BC – FPS Food Process Solutions has just launched its newest product, the Spiral Immersion System (SIS). The Spiral Immersion System (SIS) is a revolutionary new patented food processing platform for chilling, freezing, pasteurizing, cooking and chemically treating food products. The SIS is a spiral conveyor in a tank of liquid, usually water or brine, that is faster, cheaper, produces a better-quality food product, produces a safer food product and takes up less space than air chilling. “We at FPS are thrilled to bring this product to market and know that it will be a game changer for the food processing industry,” states Steve Kelley, FPS Director of Spiral Immersion Systems. “We’ve known for a long time that liquid is more efficient than air but there just hasn’t been the equipment to take advantage of those more efficient methods until FPS developed the SIS,” said David Bogle, Intralox Global R&D Director – Spiral Platforms.